Axiom Awards honor the best business books published during the past year. 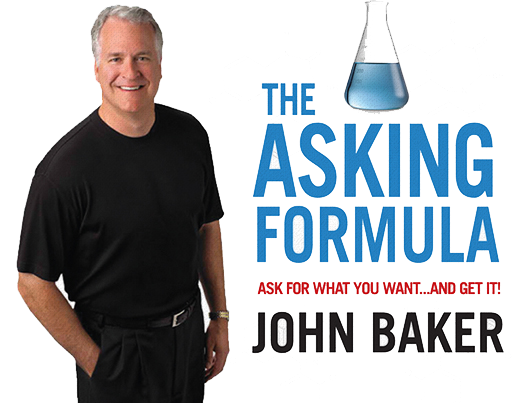 SAINT PAUL, MN (April 2, 2014) – Jenkins Group Inc., announced recently that “The Asking Formula,” created by author and speaker John Baker, earned a 2014 Silver Axiom Business Book Award. This is the 7th annual recognition announcement from the publishing firm, honoring the best business books published during the past year. This is the second award “The Asking Formula” has received, as it was recognized last spring as “Book of the Year” by the American Association of Inside Sales Professionals (AA-ISP). Baker has shared his methodology outlined in “The Asking Formula” through programs and keynote addresses across the country and in Europe during the past year. Participants learn and practice a six-step repeatable process they can apply in professional and personal situations to “ask for what they want…and get it.” Baker’s humor, expertise and coaching style create an entertaining learning environment. Learn more about The Asking Formula in this video. “I am delighted to be a multiple Axiom award winner and gratified that my simple, straightforward message in The Asking Formula has been so widely embraced. It’s an honor to be recognized among these authors and it’s been rewarding to help so many people advance their professionalism and improve their communication skills,“ said the author, John Baker. Baker’s previous book, “Ready Thinking, Primed for Change” was also recognized with a Gold Axiom Business Book Award in 2009. Both books are available at www.theaskingformula.com. “This year more than ever, the Axiom Award-winning books share knowledge that will help businesses grow and thrive, with advice and inspiration from the world’s best business minds,” said company founder Jerrold Jenkins. “Today’s innovative business people keep up on the latest trends through reading. These awards are meant to bring great books and great business people together.” A complete list of winners is available here. John Baker is an expert on teaching people to ask more effectively for what they want and gain the outcomes they desire. For over 25 years, he has taught thousands of individuals and teams a simple and practicable communications process that delivers consistently superior results. As COO for American Express and Ameriprise Financial, John has led global sales and service organizations, is an award-winning author and one of the country’s most sought-after and charismatic speakers. The Axiom Business Book Awards are the largest and most respected critical guidepost for business books in today’s new world of publishing. These prestigious and competitive awards are presented in 21 business categories and serve as the premier list to help readers discover new and innovative works. Axiom Award-winning books will help readers understand changing trends and technologies affecting the business world and point out opportunities in our complicated new economy. Nearly 2,900 books have been reviewed during the tenure of the awards program. Leave a reply / This entry was posted on April 2, 2014 by . Do you ever have trouble asking for what you want? Do you feel frustrated when you don’t get what you don’t ask for? Have you seen people be more successful at asking for what they want. We often hem and haw and hope that people will give us what we want—or do what we want them to do—if we give them enough hints. I created The Asking Formula because I was tired of people wasting my time not getting to the point. I was frustrated with salespeople not asking for the close. I was weary of endless presentations and non-ending meetings. And, I was through with training that didn’t really change behavior. What is The Asking Formula? Confident people know how to persuasively and courageously ask for what they want. They follow a six-step, repeatable process called The Asking Formula. Know what you want. Control the agenda and be bold. Show what you want. Two-thirds of your audience want to learn visually. Share. Only provide supporting documents if needed. This is meant to be simple, but it is far from easy to implement. Most people sabotage their effectiveness (and personal image) by practicing bad asking behaviors. The Asking Formula is about installing a culture of productive and forthright communications that provokes action and gets things done. If it were easy, everyone would be doing it. “The leader of the past knew how to tell, the leader of the future will know how to ask.” —Peter Drucker Why are so many people unable to ask for what they want? How many times during the day—in a sales call, presentation, or meeting—is it vital for you to ask for something that you want in order to achieve your goals? As a consultant, I witness the results of poor asking first hand: Failed sales calls, poor decisions, misunderstandings, damaged credibility, endless meetings and presentations, lost time, wasted resources, lack of influence and confidence. The Asking Formula is a simple way to get immediate results, deliver clear solutions, gain confidence, and generate faster growth. It empowers you to implement the most effective process for structuring persuasive communications and to achieve your objectives. Instill in yourself a bias for action that gets things done. Super-charge your influence and improve results. Leave a reply / This entry was posted on September 9, 2013 by . “The Asking Formula” effectively improves communication skills and changes behavior by teaching readers to ask for what they want and show them how to get it. MINNEAPOLIS, MN (MAY 1, 2013) — The American Association of Inside Sales Professionals (AA-ISP) announced recently that “The Asking Formula” received Book of the Year Award during the 2013 AA-ISP Inside Sales Leadership Summit Awards banquet, held on April 10th at the Palmer House Hotel in Chicago, IL. 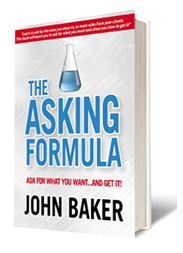 “The Asking Formula” was created by John Baker, America’s #1 Asking Expert. As a former senior executive and sales professional at some of the country’s largest organizations, John witnessed the results of poor “asking” first hand and knew there was a better way. Successful people know how to persuasively and courageously ask for what they want. They follow a simple, six-step, repeatable process called “The Asking Formula.” John has taught his program to the country’s leading companies and organizations, achieving remarkable results. Learn more about “The Asking Formula” in this video. “It is an honor to recognize John Baker and “The Asking Formula” as this year’s recipient of the Book of the Year award. John has proven his dedication to helping advance the professionalism and performance of the inside sales industry, which is the mission of the AA-ISP,” stated Bob Perkins, Founder and CEO. “We applaud John for his service to the inside sales community and are confident he will continue to have an impact on this fast growing and exciting profession in the future” stated Perkins. For a complete list of Chapters, companies and individuals recognized by the AA-ISP, go to http://www.aa-isp.org/inside-sales-awards.php. Information about “The Asking Formula” keynote presentations, programs and products can be found at http://www.theaskingformula.com/programs. Leave a reply / This entry was posted on May 1, 2013 by .